Saving taxes is something which excites everyone. There are many investment schemes like Equity Linked Saving Scheme, National Pension Scheme, Tax saving FDs, NSC, PPF which offer tax benefits under Section 80C. 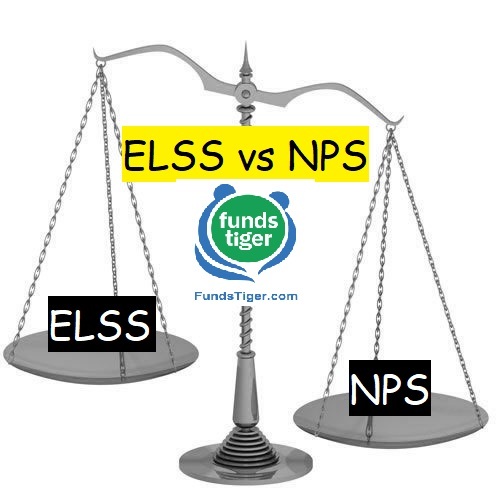 Today, we’ll look into two of the above schemes namely ELSS and NPS. ELSS or Equity Linked Saving Scheme is a mutual fund scheme that qualifies for tax deduction under Section 80C of the income Tax Act. An investor can invest in an ELSS and claim a tax deduction of up to Rs 1.5 lakh under the section. 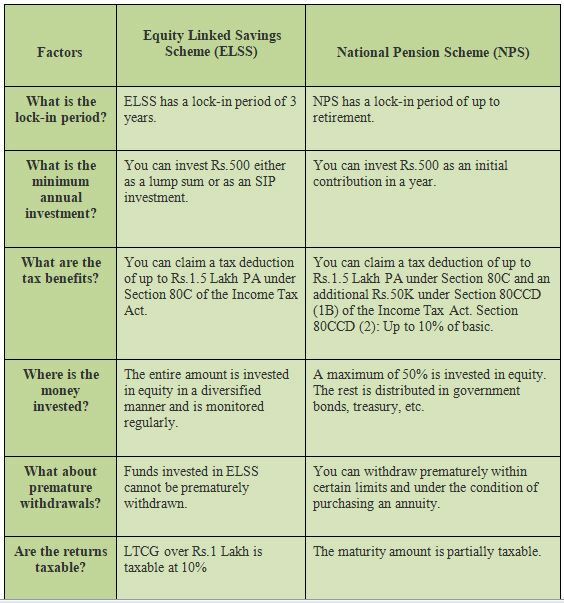 Most taxpayers get into the mutual fund universe via their investment in ELSSs. These tax saving schemes come with a lock-in period of three years. NPS or National Pension System, on the other, is a government-sponsored pension scheme that allows employees and self-employed persons to invest in it and claim tax deduction under Section 80CCD (1). NPS also qualifies for additional tax benefit of Rs 50,000 under Section 80CCD (1B). However, investors can withdraw from NPS only at the time of retirement at 60. Withdrawals before that are discouraged: one can withdraw only 20 per cent of the corpus and the rest of the corpus should be compulsorily used to buy an annuity. Employer’s contribution is eligible for Deduction. This will not form part of Sec 80C limit. This benefit will not be available for Self Employed. Lowest of below 3 will be eligible for Deduction. That’s not all. Salaried individuals can claim more deduction if their employer puts up to 10% of their basic salary in the NPS under Section 80CCD(2). There is no cap on this deduction. If your basic salary is Rs 50,000 per month and you are in the 30% tax bracket, you can reduce your tax by almost Rs 18,720 if your company contributes 10% of the basic in the NPS. ELSS allows withdrawals, NPS allows switching. ELSS funds invest only in equities, while NPS invests in a mix of equities, government securities, corporate bonds and alternative investments. Investors can choose their own asset mix if they are confident of making the right choice. Otherwise, they can opt for lifecycle funds where the asset mix changes as the individual grows older. Three lifecycle funds – aggressive, moderate and conservative— cater to investors with different risk appetites. For people who are not well versed with market vagaries, the gradual decline in equity exposure protects the corpus against volatility as their retirement date comes nearer. ELSS locked for three years; NPS till retirement. Once the lock-in period is over, ELSS investors can withdraw their funds and even stop investing altogether. The NPS has a much longer horizon. In normal circumstances, you can withdraw only at the time of retirement or when you turn 60, whichever is earlier. Partial withdrawals are allowed only for specific reasons like child’s higher studies and marriage or treatment of critical But you can do so only three times during the entire tenure of the subscription and only if you have completed three years in the NPS. How to Apply for NPS?